High-tech tracking collars on nine female polar bears have measured the animals’ efforts to find food on the diminishing Arctic ice. Each bear wore a collar – recording video, location and activity levels – for 8-12 days, while metabolic tracers tracked the bears’ energy use. This revealed that most of the animals were unable to catch enough prey to meet their energy needs. Moreover, climate change appears to be having dramatic effects on the Arctic sea-ice, forcing polar bears to move greater distances as they hunt, and making it harder for them to catch prey. The vision of a polar bear plucking a vulnerable seal off an ice floe is something familiar to wildlife documentary fanatics. Earlier this winter, though, an image of an emaciated polar bear went viral, with many asking if this was the telltale image of climate change. The authors of this study, published in the journal Science, point out that the animals do now need to travel further to find seals, and that this is likely to be an “important factor explaining declines in their body condition and survival” of polar bears. In Spring of 2014, 2015, and 2016, Anthony Pagano, a researcher at the University of California Santa Cruz and his colleagues, set out to track the polar bears’ hunting and survival during this critical season. They captured nine females on the sea-ice of the Beaufort Sea and measured the metabolic rates of each bear using blood and urine samples. They also fitted the bear with the GPS-camera collars, to record and film their activity. “We found that polar bears actually have much higher energy demands than predicted. They need to be catching a lot of seals,” Mr Pagano explained. The extent of Arctic sea-ice, as measured at its minimum in September, is decreasing at a rate of about 14% per decade, which is likely reducing polar bears’ access to seals. And their plight could be exacerbated by the need to alter hunting strategies with the seasons. In the spring, the researchers explained polar bears are mostly preying on juvenile seals. But later in the year, after the bears’ long summer fast, those young seals are older and wiser, meaning polar bears are not able to catch as many. “It’s thought that bears might catch a couple per month in the fall, compared to five to 10 per month in the spring and early summer,” Mr Pagano said. For a start, it is simply not true to say that the extent of Arctic sea-ice, as measured at its minimum in September, is decreasing at a rate of about 14% per decade. It WAS falling between 1979 and 2007, but since then has actually been increasing again. My first reaction was – so what? Is there any evidence that anything unusual is going on here? Anything that has not happened regularly in the past? It is a simple fact of nature that animals sometimes run out of food and starve, for all sorts of reasons. Fortunately Susan Crockford has taken a look at Pagano’s paper, and revealed the flaws and misinterpretations it contains. There was no discussion in the paper of ringed seal birth lairs or sea ice conditions at the time of the study, but several mentions about what might happen in the future to sea ice and potential consequences for polar bears. The press release did the same. However, as you’ll see by the sea ice thickness maps below, there may be good reason for the lack of ringed seal lairs, and a general lack of seals except at the nearshore lead that forms because of tidal action: the ice just a bit further offshore ice looks too thick for a good crop of ringed seals in all three years of the study. This is reminiscent of conditions that occurred with devastating results in the mid-1970s and mid-2000s (Burns et al. 1975; Cherry et al. 2009; Harwood et al. 2012, 2015; Pilfold et al. 2012; Stirling 2002, Stirling et al. 1987). Those events affected primarily bears in the eastern half of the Southern Beaufort and were almost certainly responsible for the recorded decline in SB bear numbers in the 2001-2010 survey (Bromaghin et al. 2015; Crockford 2017; Crockford and Geist 2018). It seems very odd to me that Pagano and colleagues suggested no reasons for the unexpectedly poor showing of polar bear hunting success during their study except a bit of hand-waving about higher-than-we-thought metabolic rates in the bears. For years, I’ve worried that the inevitable next episodes of thick Southern Beaufort spring ice would cause problems for polar bears and seals but we wouldn’t know it because whatever effects were documented would be blamed on reduced summer ice: I suspect that time may have come. DMI charts confirm what Susan is saying. If we compare April 2003 with April 2015, for instance, we can see that the ice is much thicker off the Alaskan coast. Also there is little difference in ice extent in the Beaufort Sea. NSIDC show sea ice extent more clearly. The Beaufort Sea is clearly full of ice in both years. The areas where there is less ice are either outside the Arctic basin completely or in the Barents Sea. Clearly the supposition by Pagano that polar bears are going hungry because of reduced sea ice is bogus. But don’t expect the BBC’s “Science” correspondent to bother to check the facts and ask a few pertinent questions. In other words, more Fake News from BBC. The BBC always fails to cover the important scientific issues. Where is the BBC’s coverage of the attempts of the James Cook University to suppress Prof Peter Ridd? When has the BBC defended academic freedom and scientific integrity? Those are rhetorical questions, in spite of the question mark at the end, right? Tell the BBC that polar bears suffer in years with too much ice and their heads would go pop. How long will it take these wizards to suggest sending the Polar bears the US Navy Seals? Just as logical. Anyone who would believe that Polar Bears are starving is is dimwit! They are doing just fine, thank you! Obviously not every polar bear is going to get enough to eat. Otherwise we’d be overrun with polar bears. Also – won’t someone think of the ringed seals? Only if someone clubs the pups to make fur coats. Otherwise, it’s “natural” and the seals can all die as far as environmentalists care. I saw this live yesterday morning and was particularly amused to see that the expert that they interviewed to accompany the video was a professor from Edinburgh zoo. All went well as he reinforced the nonsense with the usual doom and gloom pronouncements, but he became less articulate and degenerated into stuttering as the female interviewer went off piste into a more general area of AGW lore and lies. Later bulletins that day did not include the hapless professor!!!! Whenever a predator is almost completely dependent on a single prey species, it will be the success of that prey species that determines the success of the predator. They would be better off studying the seals and their movements than the bears. Obviously the depth and location of sea ice is more important to the seals than to the bears. Most subarctic and arctic species are subject to boom and bust population cycles. A second thought is that they surmised greater movement and lower hunting success than prior observation, but they were using “new” technology which obviated much prior comparable knowledge. Nine bears in one area for a couple of years doesn’t give much of a base to work from. Get back to me when they have a hundred bears across the arctic range for 10+ years and I will listen. Better yet – leave the bears alone. They have survived much greater changes in the arctic over time. The bear population has increased dramatically since the 1970s, when hunting was restricted. 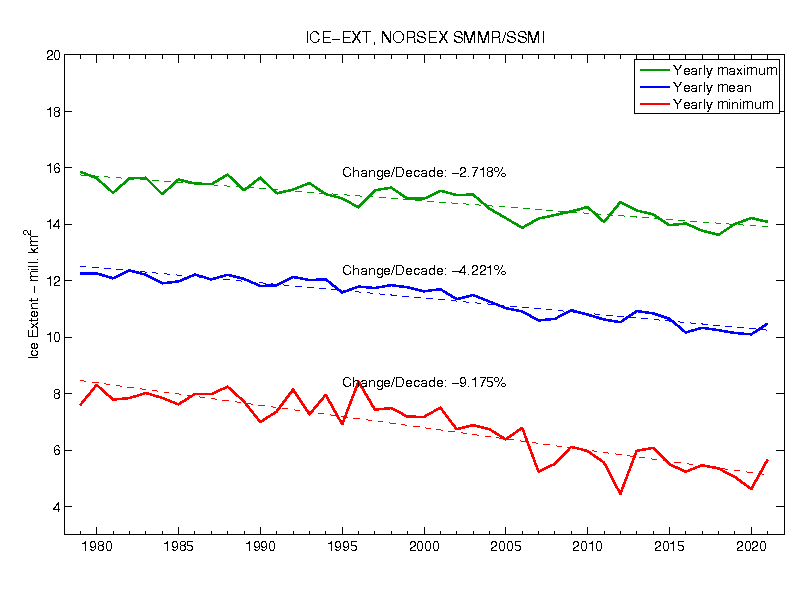 It has done so during the 1980-present slow decline in sea ice. It makes one wonder what happened during the rapid sea ice expansion just prior to the 1979 satellite monitoring began. I suspect that heavy sea ice played a role in populations during the 1970s – not just hunting. There is no impending doom, and I doubt that climate change is involved in the manner they ascribe. Indeed, a return to colder winter seasons as the AMO flips may well be an issue as sea ice again increases. There you go with facts and well stated logic. We cannot have that. Susan Crockford already debunked this study scientifically. Answer is too thick spring sea ice in the study area. Has happened twice before, and both time bears died/moved then the population recovered when the ice conditions moderated. THere is another possibility that Susan could help with, are there also more polar bears in the area? If so there is less food per polar bear to go around compared to the past. “with many asking if this was the telltale image of climate change” Only the brain-dead media and the koolaid drinkers are asking that. These people have lived next to supermarkets all their lives. They have ZERO comprehension of how animals obtain food, the feast and famine nature of hunting one’s dinner, etc. In other words, they are 100% clueless. Wild animals frequently use more energy than they consume. For example, in the western USA, a cold and snowy winter(‘16-‘17) caused death of many deer (and other animals). So, . . . It is terribly sad to see animals that are dying or have starved during the winter, or for any other reason (perhaps an injury). We do see this because we do live within the deer and elk habitat. As linked to above, it makes the newspapers. The up-side of nasty winters is that insect populations, some that damage forests, are severely reduced. Sounds as though there are too many deer for the less than “ideal” situations. Sounds as though there needs to be further herd reduction. I wish we had that problem in my yard in Morgantown, WV. Also it was announced this morning on WV Outdoors that we have 65 elk coming this way from AZ. They will join the 24 from KY we got 2 years ago. Fortunately they are all in the Southern Coal Fields near the KY-OH borders and not near my garden. Oh, goody. Another aspect is that major highways, such as Interstate 90 across the Western USA, are serious danger to wild animals. Many deer and elk are killed every year. Cars are usually demolished when hitting an elk. Collision with a deer is a bit less serious because they are a lot smaller. Unlike “global warming” there is something that can be done. Animal crossovers and under-crossings work, but are expensive. Consider this link, if you wish to learn more. You can be sure that the BBC and their ‘experts’ won’t let factual information spoil their story!, after all these scientists require more and more funds!! No source was provided for that claim. Brought up in Northern Ontario, where the Polar bears munch – whatever they want. the changes/decade are -2.7% for the yearly maximum and -9% for the yearly minimum . and even these trends do nota llow for recent flattening of the decreases . Or…Polar bear ‘experts’ running out of credibility. Typical BBC opining complete bollix about Polar Bears, while old people all over Britain are suffering with lack of heating/lighting, adequate food, or social life. BBC worries about Polar Bears surviving with or without snow while the numbers of people homeless and living on the street has risen. The BBC emotes about Polar Bears having or not having a normal life while more children than bears suffer abuse, hardship, trafficking, etc all across Britain. Blocks of flats can burn to the ground in BBC land, and none of the opinionated journalist ever reported a micro-second of real investigative reporting before any of those events, and bloody little after a major disaster. A bunch of complacent, worthless lovies, emoting and virtue signaling ordure on the British population, and then demanding they pay for it. Enough to make me vomit!